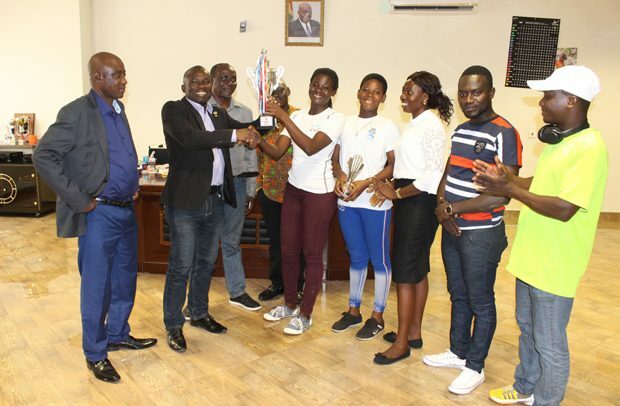 The Junior National Netball Teams A and B, the Rising Stars of Ghana participated in the CNB Tournament on January 12 in Lagos, Nigeria, a statement signed by Charles Obeng Amofah, acting head, PR of the National S[ports Authority (NSA) has said. The two-nation tournament is a bi-annual competition with teams from Ghana and Nigeria competing for honours. The Rising Stars A and B teams of Ghana won their respective matches to lift the two trophies at stake. In a related development, the Ghana Netball Federation, led by the Secretary General, Madam Gifty Mills, and some national coaches presented the two trophies won at the competition to Prof. Peter Twumasi, the Director General of the National Sports Authority. Prof. Twumasi, who was impressed with their performance, donated an amount of GH¢2,000 to the teams, so as to encourage them to go for more laurels in future. He also advised them to concentrate on their education so that by the time they graduate into the senior national team, they would have become mature and self-dependent adults. He further expressed his delight on the achievements of the least finance sporting disciplines, who in his opinion are winning more silverware for the nation on the international sporting front.